Organized labor gave all American workers benefits they now take for granted. But conservative political control and automation are big enemies of any union for beleaguered Amazon fulfillment center employees. “Six minutes tops” for a bathroom break at an Amazon warehouse is hardly the “dark satanic mills” described in William Blake’s immortal description of the early Industrial Revolution. Still, one would hope humanity had made more progress over the past 200 years, so that nature’s call wouldn’t present such anxiety to any employee in an advanced nation. Yet this was among the many indignities and pressures on workers at so-called fulfillment centers, described by my colleague Nina Shapiro in a recent article. James Bloodworth, a British journalist, chronicled his experience working at several companies in the book, “Hired: Six Months Undercover in Low-Wage Britain.” Amazon employees, he wrote, are given “impossibly high” productivity targets, measured by constant electronic surveillance. The closest restroom was four flights of stairs away. The same could apply in the United States. 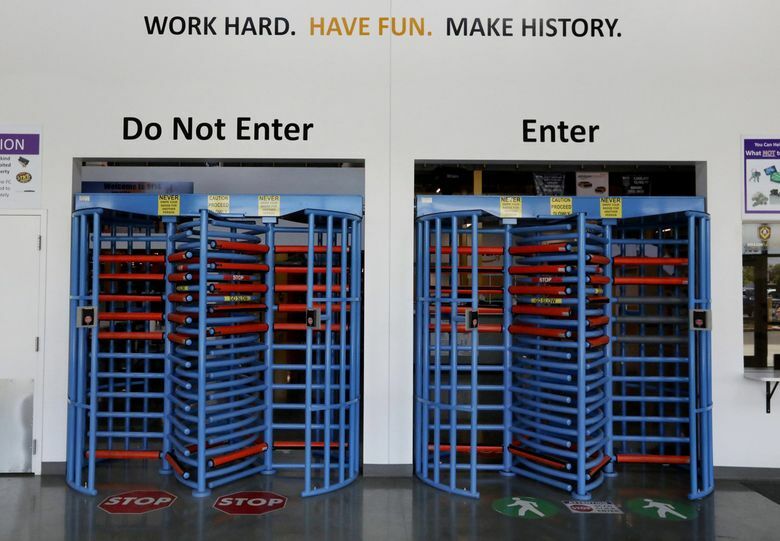 The “six minutes tops” comment came from an employee at Amazon’s Kent warehouse, which employs 2,500. At least one of the statements is true. To be fair, Amazon says it doesn’t monitor toilet breaks and the facilities are “just a short walk” from where employees work. Still, this isn’t the first time the Seattle-based giant has faced criticism for pushing workers to the limit in its massive warehouses. A notorious example came in 2015 when workers were getting sick from lack of air conditioning in a Pennsylvania warehouse. The company, shamed by the coverage, added cooling. Nor is it limited to Amazon’s blue-collar workforce. Remember the New York Times’ shocking “crying at their desk” expose of the elite employees in Seattle from the same year. “At Amazon, workers are encouraged to tear apart one another’s ideas in meetings, toil long and late (emails arrive past midnight, followed by text messages asking why they were not answered), and held to standards that the company boasts are ‘unreasonably high,’ ” that story said. CEO Jeff Bezos responded to that NYT story, telling employees that “the article doesn’t describe the Amazon I know or the caring Amazonians I work with every day” and the company would not tolerate the behavior it depicted. Whatever the truth, 238 localities submitted bids for Amazon’s massive HQ2 second headquarters; proposals have been narrowed to 20 finalists. All are apparently willing to throw huge sums in incentives to land 50,000 high-paying jobs and $5 billion in investment. Fulfillment centers, though populated with workers earning much less than the headquarters staff, are also major economic-development prizes for scores of communities nationwide that are desperate to land jobs. They usually dangle tax and other incentives to win. The Economic Policy Center, a center-left think tank, estimated that a fulfillment center increases warehouse positions by 30 percent in the host county, but overall job totals don’t rise. Apparently jobs in other sectors continue to decline. That conclusion is unlikely to change minds or policies. In a nation where the largest employer is low-wage Walmart (and well-paying large companies are reserved for the tech elite), politicians and policymakers are under pressure to add jobs, particularly for the less educated or skilled. For much of the 20th century, those workers could enter a host of manufacturing and other sectors while gaining skills and working their way up, with secure jobs, improving pay and benefits. Because of automation and globalization (where manufacturing and assembly are offshored to factories, often with few worker protections), most of those opportunities are gone. The average $15 an hour wage, with benefits, for a permanent, full-time fulfillment center employee looks good. Shapiro’s story produced a large number of reader comments. The range of opinion was stark. My reaction to the Amazon stories: These people need a union. Layoffs at Whole Foods after the Amazon acquisition have raised the discussion. In a long struggle, organized labor helped bring an end to the first Gilded Age of the late 19th century. It enshrined the end of child labor, the eight-hour workday, worker’s compensation, higher wages and a host of other reforms. Unions were also an essential counterweight to the abuses of corporations and the assembly line. Those work conditions are enjoyed today by most employees, organized or not — even the ones who hate unions. They’re taken for granted by people with no historical knowledge of the literal blood shed by union workers of earlier eras to win them for all. A strong union at Amazon would ensure employees had bathroom time, and much more. Unfortunately, last year unions represented only 6.5 percent of workers in the private sector. In the 1950s (when many think America was “great”), the rate was around 30 percent. Blame the decline of traditionally unionized industries, organized-labor overreaching and corruption in some unions. But labor was also undermined by decades of conservative and corporate efforts to tilt public policy against unions. This includes the restrictive Taft-Hartley Act of 1947, President Ronald Reagan’s breaking of the air-traffic controllers strike in 1981 and decades of pro-corporate Supreme Court rulings. According to a Pew Research Center poll last year, most Americans held a favorable view of unions (higher than that of corporations). In much of Europe, unions retain power. And Amazon, although resisting, has faced some organizing gains. This past year, the company contended with threatened Black Friday strikes at warehouses in Italy and Germany. But in America, conservative Republicans hold power in D.C. and are likely to cement a right-wing Supreme Court for decades. This is throwing unions back to the ‘90s — the 1890s. Amazon itself could respond to a unionization effort by increasing automation. The company is already a leader in using robots. So until the pendulum swings back to some balance — a long arc of history — warehouse workers will be at a huge disadvantage. And the resulting political and social instability is only beginning.